January | 2011 | Professional Use Only, No Warranty. After watching the NHL All Star Skills Competition I noticed the ever increasing amount of players using the Total One stick. And then I noticed something unique about those very Total Ones. Every player using one has the standard yellow graphics package adorning their stick. That is, except for Eric Staal. He can be seen above congratulating Michael Grabner after his victory in the fastest skater competition. I took a further look into previous photos of Eric Staal to see if this was a special one time all star stick, or if it had been issued earlier. 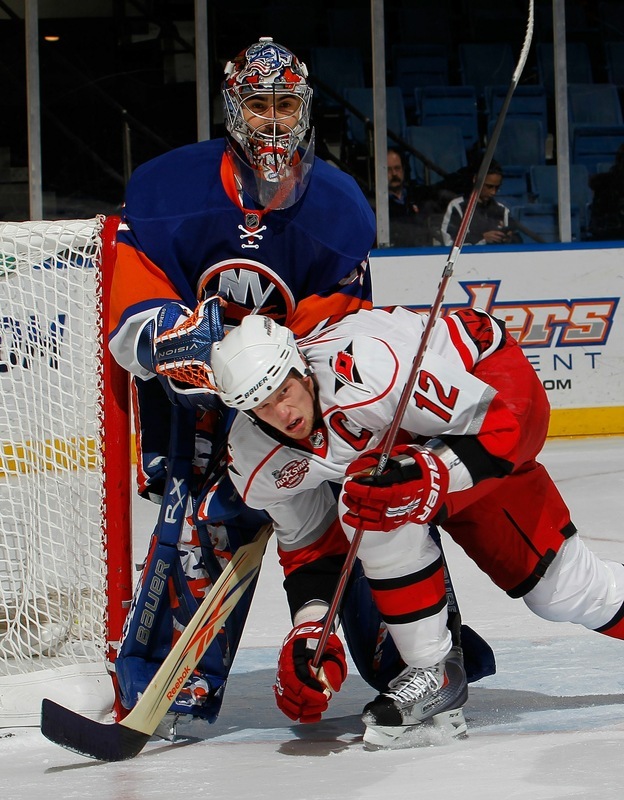 The following are two photos of Staal. One in a game against the New York Islanders, and the second against the Atlanta Thrashers. The game in Atlanta took place on December 16th 2010, proving that the stick is not a one game special. This begs the question. Will Bauer start introducing the Total One in multiple color packages for NHL teams, and will this filter down to the retail version? I am inclined to believe they will, as this is exactly how the original Bauer One95 stick progressed. It debuted in one standard graphic package before getting several makeovers in a wide range of colors. Bauer has certain established it’s iconic image with the yellow Total One, helping build it’s customer recognition, it would be a great time for them to introduce more options for both pro stock and retail models. All images are property of Getty Images and their rightful owners. No copyright infringement is intended. I just had my 4th ice time between the pipes and it’s been quite the ride so far. The first thing I really needed to get accustomed to was getting into a routine. As a skater I would always pack my bag the same way and put on my gear in the same order every ice time. My main priority was to develop a routine and throughout the course of my first couple of ice times figure out what works and what doesn’t. Growing up in the 90’s and watching goaltenders like Kirk McLean and Mike Richter playing the stand up style of hockey really influenced myself in the style I played on the street. Because of that my initial reaction to blocking shots is to do a kick save instead of the more conventional butterfly style where you try to cover the bottom of the net as much as possible. I understand how players like Gretzky were able to score 92 goals in a season back in the day because it has to do with how much goaltending techniques have evolved and improved over the years. Some may think that only the fat kids can play goalie but it’s far from that. Goaltending has become so specialized over the years that athletes have to be fit to play the position. It was very difficult to slide on the ice and in total I let in something outrageous like 16 goals but the majority of them were 2-on-1, 2-on-0 or breakaways so my chances of stopping those were already pretty slim to begin with, especially for a beginner. A couple of the shots should’ve been routine saves but I mishandled them. I strapped on the pads at the Richmond Olympic Oval and whoever thought of having the rink and dressing rooms on different levels obviously never played hockey before. The elevator was out of order so I had to walk up a flight of stairs in full gear just to get to the ice, mind you these steps are not extra wide or anything to accommodate for goaltenders with big equipment. This time I focused on my technique and more importantly, being able to butterfly slide. One mistake I learned was not to have too narrow of a stance. The reason behind this is if you have a wide stance and you drop to your knees and close your 5 hole, the pads will rotate and will be square to the shooter. If your stance is too narrow the pads won’t be able to rotate and the face of the pad will be on the ice. This is a problem because it exposes your knee and even though there are thigh boards giving you a bit of protection, it WILL hurt if you get shot there. I learned this the hard way. I faced a lot of shots during these two clinics and I’m already starting to develop bad habits such as playing too deep in the crease. At the end of the 4th session I’m doing alright with all the far shots and rebound control but shooters are still getting the best of me in close. I’m also getting beat quite a bit in the 5 hole when I butterfly slide because of poor stick discipline. I need to be aware of these things during my next couple of ice times but the positive is I am getting better slowly with experience. We got our hands on a pair but what do we think of them? I absolutely hated the Supreme ONE90 and ONE95 so will this one be any different? I’m currently using the Total ONE skates and stick so will I go all decked out in this new line? There are currently no reviews on this glove anywhere on the internet yet so ProStockNation.com will be the first to do so. First off the staff at ProStockNation.com would like to wish all of our readers a happy new year and thanks for all the comments and support we received in 2010. We have high expectations for 2011. Edler recently switched over to the new Bauer Supreme Total ONE gloves from the Vapor XXXX Pro he’s been using for the last little while and it’s no surprise. Ever since the influence from teammate Mikael Samuelsson to tape the cuffs of his gloves it looks like Edler wants a tighter fit and is there anything that fits more snug than a pair of Supremes? Why didn’t he make the switch to the Supreme line sooner? Our only guess is because the Supreme ONE90 and ONE95 were terrible gloves from a fit perspective. We’ll dive more into the details when we review the Total ONE but the older model Supremes were the only gloves to constantly scrape my knuckles whenever I opened and closed my hands. The Total ONEs don’t have this problem. One aesthetic change we noticed is the signature golden ‘jewel’ on the glove has been deleted from Alex Edler’s more recent pairs. These aren’t just glued on (stitched to be exact) so it’s impossible for them to simply fall off or to remove it with no traces of it being there previously. It’s a minor cosmetic change to note but it would be interesting to see if he is the only player with this option or if more players follow suit. I’m currently testing out a pair of Total ONEs right now and they’re definitely better than previous generations but how do they stack up against other offerings from Bauer and their competition? Keep posted to our blog to find out. You are currently browsing the Professional Use Only, No Warranty. blog archives for January, 2011.